Sky Bingo is giving you one million reasons to turn your frown upside down this month, with the launch of its spectacular £1 Million January Jackpot, plus it's Winter Rewards scheme! With Sky Bingo, you can party all the way to the bank from Monday 11th January to Sunday 31st January! That's because every day Sky Bingo is giving to chance to snap up your share of up to £1 MILLION worth of cash prizes! So even though the weather outside may be frightful, the sky's the limit! You can head to the Sky Anytime and Deal or No Deal 90 Rooms every day for plenty of chances to scoop a slice of the £20,000 jackpot prize for each game! That's not all folks, as from midday each day, each jackpot will escalate by one ball call. Then from 6pm, the jackpot will escalate again to 2 ball calls, which will run until some lucky player hits the jackpot! Make a note in your diary, as from Thursday 28th January to Sunday 31st January, the daily jackpots will DOUBLE up! This means you'll have the chance to win up to £40,000 in the Sky Anytime and Deal or No Deal 90 Rooms! Sky Bingo is also brightening up your January with its Winter Rewards Programme! You could be one of the 150 unique players each day that could win a surprise cash prize or a bonus treat! Each time you spend £5 cash on Bingo or Slots until 31st January, you could earn a ticket to the prize draw to win prize treats like £5 cash, a £5 bingo bonus, £10 cash, £10 games bonus or a £20 bingo bonus! Don't worry either, as even if you don't win a prize, you can still hit the £5,000 Rewards Room on Mondays between 7pm and 9pm! 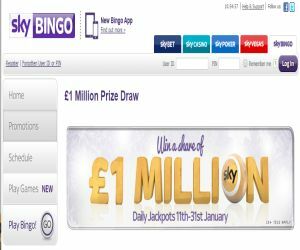 The sky's the limit with Sky Bingo!